I am not a coffee drinker as coffee gives me a headache so if I have to drink, I would order a hot chocolate while my hubby enjoys his mocha or cappuccino. During our Europe trip as well I had hot chocolates instead of coffee whenever we sat down in cafes for drink. While in Burano, we fell like a coffee and cookie so we went to this small café along the way. We asked for a hot chocolate, a cappuccino and some cookies. The cookies were yummy and AS was happy with his cappuccino but I was surprised to get a cup full of thick hot chocolate with no milk. It looked more like a dessert you get in Max Brenner than a drink I was expecting. It was so thick that it stuck to the sides of the cup. It was very dark and with a bitter edge but too sweet for my liking. I didn’t know what to do with it as I could not drink it. I dipped a few cookies into it but did not drink rest of it . I was a bit disappointed that I could not get my normal hot chocolate. That was not the only time we were served a thick hot chocolate. In Rome as well, I got the same drink when I ordered a hot chocolate. Luckily we had an Italian couple in our tour group so they helped me get a cup of warm milk and I made my own hot chocolate by mixing the thick chocolate with milk. 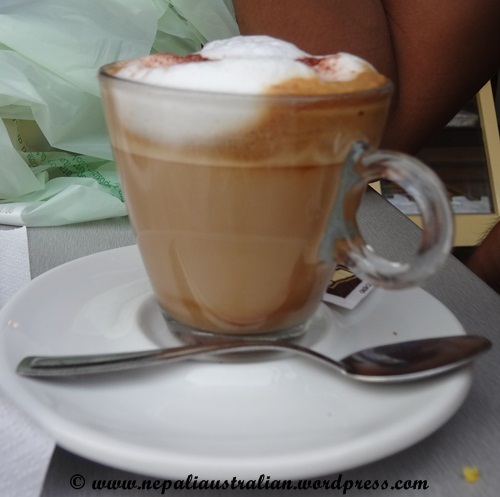 So after coming back to Sydney, I goggled what really happened to my hot chocolate in Italy and this is what I found. I got Cioccolata Calda when I asked for hot chocolate. Chi-o-co-la-ta Call-da is Italian for Hot Chocolate. 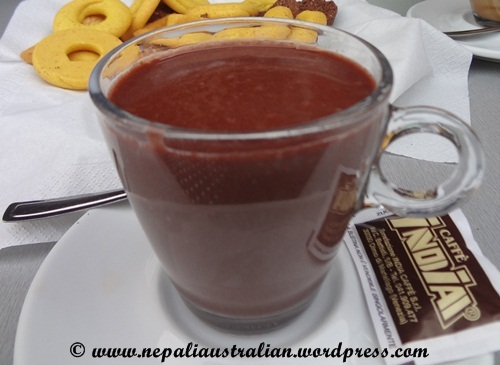 Cioccolata Calda is described as authentic Italian Hot Chocolate which is a cup of thick, delicious, creamy, pudding like consistency, hot chocolaty goodness. I should have asked for milk chocolate if I wanted my normal hot chocolate. So remember if you ever visit Italy, do keep in mind the difference. 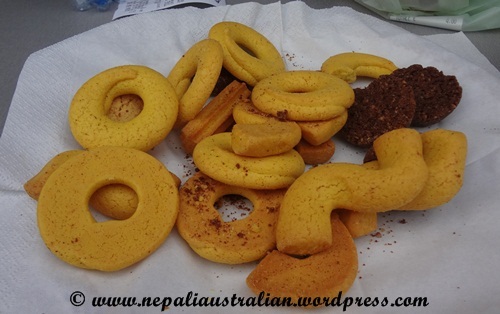 I learnt my lesson to do some research on food and drinks for the next time I travel. If you want to try your own Cioccolata Calda, click here for the recipe. 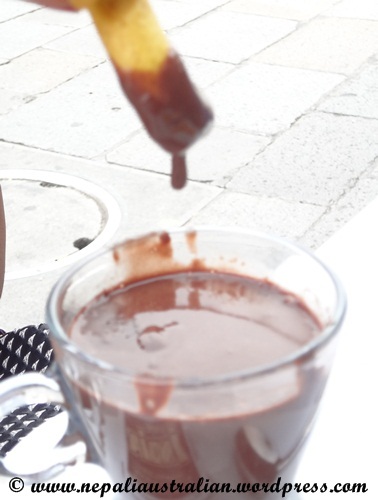 This entry was posted in Foodie, Italy and tagged Cioccolata calda, Hot chocolate. Bookmark the permalink. Yes it’s bizarre isn’t it? Nice, but offputting if think you’re getting a drink. Ooops… accidental post there. That would take care of a sweet tooth!